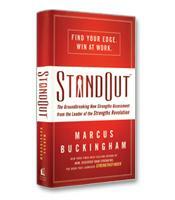 StandOut introduces the next-generation strengths assessment from Marcus Buckingham, co-author of Now, Discover Your Strengths. The StandOut assessment unveils your two key strength roles and shows you how to find your edge and win at work. Whether you're an individual who wants to find your edge, a manager trying to fully understand the strengths of your team, or a leader in an organization looking to stay on the cutting edge of the strengths movement, you need StandOut. How you can win as a leader, manager, salesperson or individual contributor. How to use your strengths to win at work.